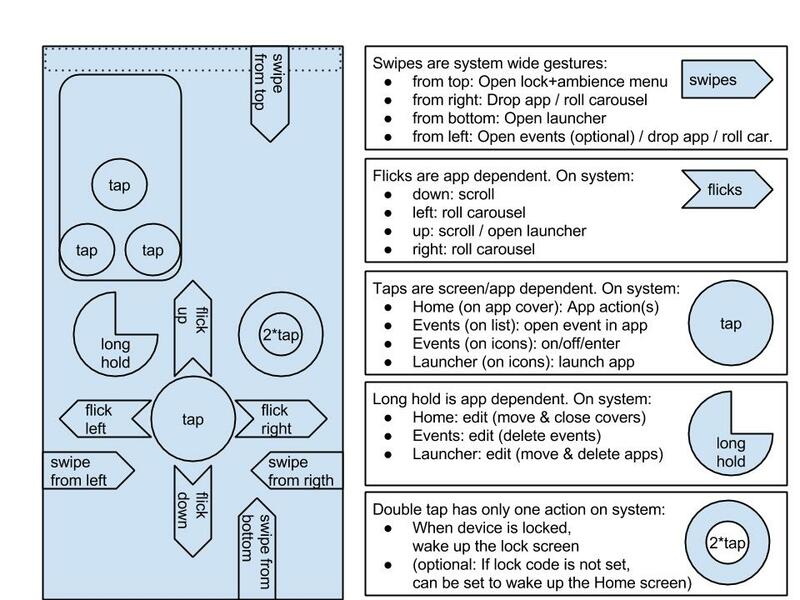 The key values on a mobile operating system designed for a smartphone is to be intuitive, easy to reach and use with one finger, and of course fast and responsive. While expanding the same user interface to larger devices like tablets, some compromises must be made to meet a similar user experience on both. How did Jolla manage on this? We leave this for you to decide, sharing an insight into the actions needed on both old and new. On Android, some of the most important taps are placed on top corners with small icons. On this aspect Sailfish OS beats Android in the user experience completely. 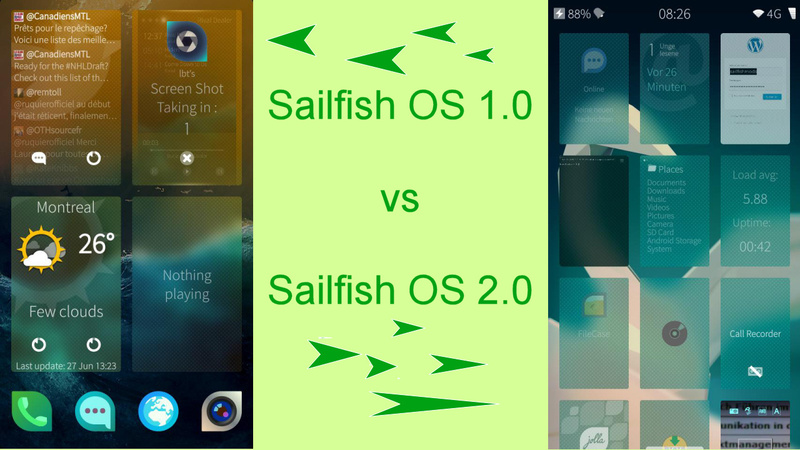 On a smartphone, Sailfish OS is a one thumb user interface. On the other hand, having even less taps in general on Sailfish OS 1.0 was seen as perfect by many users. While reading on, please take a note on that. There is a compromise regarding taps, which seems to be required while extending to larger devices. Note also how the placement of gestures was done: Most of the gestures are available also in the bottom of the screen, right under your thumb. Click the image above to open it in full size. 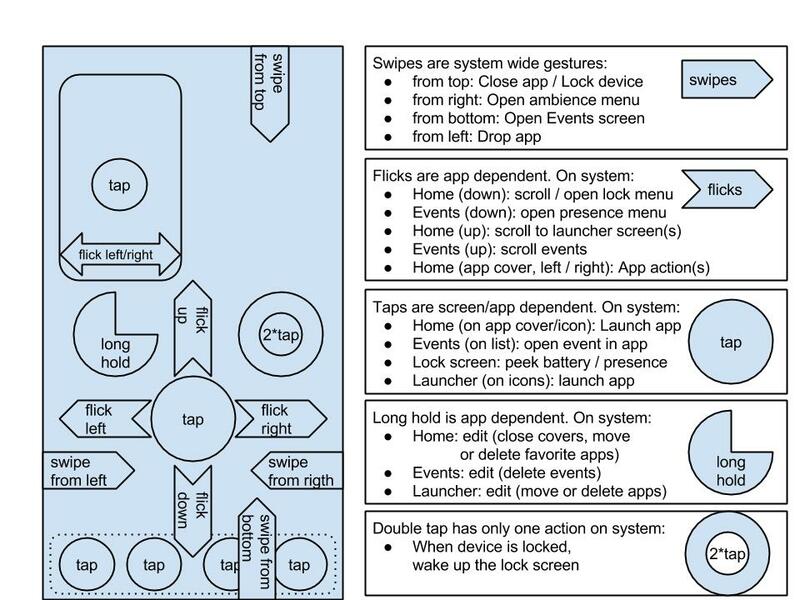 Biggest changes take place on the placement of the system screens, radically changing the swipe gesture actions. Events were moved from below the Home to left, and ambiences were moved from their dedicated screen on right to a top pulley menu. App cover actions were changed to taps instead of flicks, and favorite apps were removed from the Home screen. On top there's a new info bar, similar to Android - earlier this information was visible between the home and lock screen. Click the image above to open it in full size. The most used actions should be (A) the most intuitive ones and (B) the quickest to perform. I collected a table of few selected actions below, and it seems that while Sailfish OS 1.0 was quicker to use from the Home screen, Sailfish OS 2.0 brought speed into situations when already using some app. On Sailfish OS 1.0 the gestures were also varying more. Sailfish OS 2.0 seems more intuitive on this, having a shorter learning curve. On gestures, Sailfish OS 2.0 has some major changes which might cause some negative feedback from long time users who already have learned their ways, and have their routines on those. 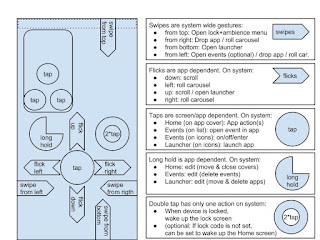 However, it seems the new user interface is easier to learn, and especially while the new system wide gestures have more similar workflow, not dependent on having app on the foreground or not, it should be easy to learn out from the old routines. For new users coming from Android user interface, these changes must be more than welcome. Adding a new info bar on top of the Home screen, implementing the carousel to change views, and changing the cover actions from flicks to taps are closer to their routines. Peek for time. When in app, there is a swipe-from-side gesture to drop the app to Home screen. Earlier, it could be used to just peek time, returning your finger to return to the app. Now the time is just too difficult to see. Having the app launcher always available, right under your thumb, is exceptional. Loving that! About closing applications which has been discussed somewhat a lot (the change is radical), I think that Sailfish OS 2.0 doesn't fail on this. It's supposed to be a multitasking operating system, and after the current bugs and memory leaks are at some point fixed, it's only nice to keep all the apps in the home screen covers. Also the change to not let them change places with each other is welcome, especially after the favorite apps were dropped to the separate launcher screen. 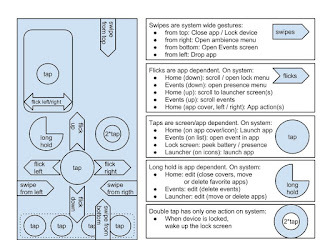 Technical images: Sailfish OS gestures by Review Jolla is licensed under a Creative Commons Attribution 4.0 International License. 1. "Pay next song" on SFOS 2.0 is just one tap. Media app has two cover actions: pause and next. 2. Changing ringtone volume now is so easier and faster, especially for Android users. 3. "Close app" can be a swipe also on SFOS 2.0. 4. Add an "on lock screen" column and you'll feel the changes. I like new changes. The most annoying thing for me was these tap cover actions, but after some days of using I'm accustomed to it and gonna like its fastness; especially in case of changing music tracks or using stopwatch. Finally, about full brightness, a tap on the right (outer) side of the brightness slider is fast enough, isn't it? Change ringtone volume on "SFOS1 In app" needs an additional flick after the swipe. On SFOS2 you can change it simply using HW buttons. Also silencing can be done with a long press on volume down. 4. How do you enter the lock screen on SFOS2 (using gestures)? Full brightness: That's fast, but accessing that bar is not. Especially difficult to find when the brightness is low and the surrounding is light. Hidden bar somewhere on the Home screen would be great. I also believe the cover actions as taps might actually work well, after one just gets used to them. But are they really faster in the end, I'm not sure on that - especially when having more than 4 app covers, the area to tap gets quite small, and precise aiming takes more time than a flick. About (4), consider taking the phone out of your pocket you want to do something. SFOS 2 will be faster in half cases and have no many differences with when you are at home or in app. Close app gesture has been added to the gestures settings, bur enabling that also makes some things slower to do. It's good they added that because I don't like keeping too many apps open so I keep closing them with the gesture. I think I'll try to live without the close app gesture and actually start keeping some apps open instead of closing them all the time. I personally never got used to the cover pull actions and always felt they were a bit cumbersome. I often even forgot about the actions and went straight into the app instead. Taps are a lot intuitive here but may be a bit hard to trigger with more than 4 apps. I think I have started to use the cover actions more since the update. Oh yes, I considered that setting option as slower when writing the table to the post. Enabling it would add one step (when in app) to the actions using the top menu (silencing, locking). But for the people using hardware buttons for these two, it does speed up the overall experience. Great that there is that option! One thing i miss in sailfish is an easy way to choose connection, i need an way to choose connection for every time i connect to internet. N9 did this perfectly where i could choose any wifi network or 3G for every connection and i need this. I still find N9 to be better then my jolla and better UI but the 2.0 UI in sailfish is way better and more like my N9.